Regular readers of this blog will know that, if there’s one thing we care about very much here at Onlineability, it’s that people should have good access to the information they need to make decisions and live their lives well. Whether that’s a website that’s clear and easy to use or proper access to a local library service, it all comes down to the same things – accessibility, being user-centred and available when people need it, in ways that they find convenient. Libraries in the UK are in a lot of trouble right now. Austerity measures have meant less money available for local government and some councils are making huge cuts to their services including closing down branches, cutting mobile rounds or replacing paid staff with volunteers. Here in Hertfordshire no branches have been closed but opening hours have been cut by a third and Hertfordshire County Council is now exploring ways that voluntary and community organisations can get more involved with the service. Trouble is, we believe that library cuts are a false economy. You might think of a library as a place to go to borrow books or read newspapers, or maybe to get Internet access, but these days it is so much more. Libraries provide services that underpin our communities – whether it is information for entrepreneurs and would-be business owners, support for parents, learners and educators, or advice on how to deal with the many different problems that life throws up before they get out of hand. And that’s without everything they do to make people’s lives richer – by helping them pursue interests, enjoy their leisure, get more involved with their communities or take part in arts, literary or cultural events. We think that cutting access to libraries will simply mean that calls on other public and voluntary services will become more acute and put them to more stress and expense. And, because we think it is really important that someone is speaking up for libraries locally, we decided to do just that. 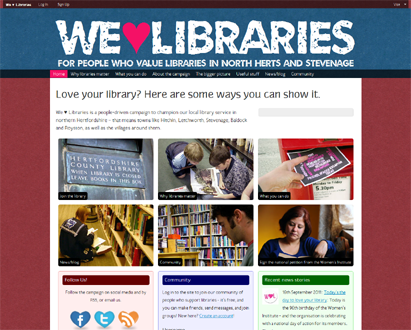 Accordingly, we’ve built the We Heart Libraries website with the aim of celebrating everything that’s great about libraries in North Herts and Stevenage – and championing them in times of trouble. This isn’t a project of the company but a separate, voluntary cause that we’re supporting because we think it’s really important and worthwhile. Onlineability director Andy Darley said of the project: “I grew up in Hitchin and the library was like a second home to me. As a child it was a place of magic and wonder, and it really matters to me that people all across our area – whatever their ages or backgrounds – should have the same opportunities I had. So, why not pop along, take a look and even sign up to start helping campaign for our local libraries. We’ll be needing all the support we can get to make a big splash for National Libraries Day on February 4. We hope you will join us. Filed under Events and happenings, Things we've done and tagged with libraries, voluntary sector.